The power is adjustable through it's TTL control or by a 5K variable resistor, small design with excellence PWM control circuitry. It supports any CO2 laser for up to 40W. Application for engraving, seal-cutting, etc. The start and stop of laser can be easily controlled by TTL level. The protection switch to test the external water, ventilation, etc. The 40w co2 laser power supply with high performance and large cutting power. It laso can timely scene judging which part is damaged, laser tube or laser power. 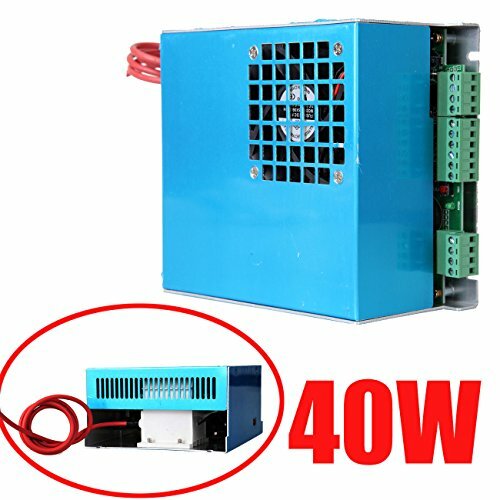 This 40w laser power supply supports any co2 laser for up to 40W, dramatically lengthen the service life of laser,widely used in engraving/ sculpture, seal-cutting, cut acrylic, fabric, double color sheet and rubber etc. The power supply has output open circuit protection and a buttonto test to output laser manually. Each laser power supply will be tested by full load condition for 12 hours for aging test,stop the power test after 500 times. Input and output of power supply are separated completely to avoid getting an electric shock. It can work in open-circuit condition for a short time (Require a good protective grounding and avoid arc between the positive and the machine shell).